While we have featured our inspiring Purposeful Purveyors in past editions, this week we decided to switch things up and give you an intimate look into the Packed with Purpose team. We’ve had exciting updates and developments in the past few weeks, so we did a brief Q&A session with our Founder and CEO, Leeatt Rothschild. One of the most exciting updates is that Leeatt was recently accepted into the WiSTEM Cohort at 1871, a 12-week curriculum-based program that connects women to capital, community, and technology resources. Packed with Purpose is one of 13 startups picked for the program. Q: Congratulations on your acceptance into WiSTEM. Can you share a bit about what you are most looking forward to getting out of the program? A: I’m most excited for the mentorship opportunities. Being surrounded by passionate women who are bringing impressive products and services to market; learning about how they’re scaling their businesses is going to push me to grow as an entrepreneur. As we grow, so does our impact! Q: Do you have any advice for other women running startups or who are considering launching a company? A: Don’t let doubt get to you. And don’t overthink things. If you have a vision and see an opportunity, keep pushing ahead. You can’t shut down the opportunity before you’ve given it a shot. Q: What have you been focusing on? A: We’ve been working closely with a number of our corporate clients from last year on their 2017 end-of-year gifts. We’re exploring a few new Purveyor partnerships. We’re curating great gift collections for the upcoming months. We’ve made updates to our corporate gifts page to make it easier for companies to give gifts that are both thoughtful and socially conscious. Q: Are there any new partnerships you are particularly excited about? 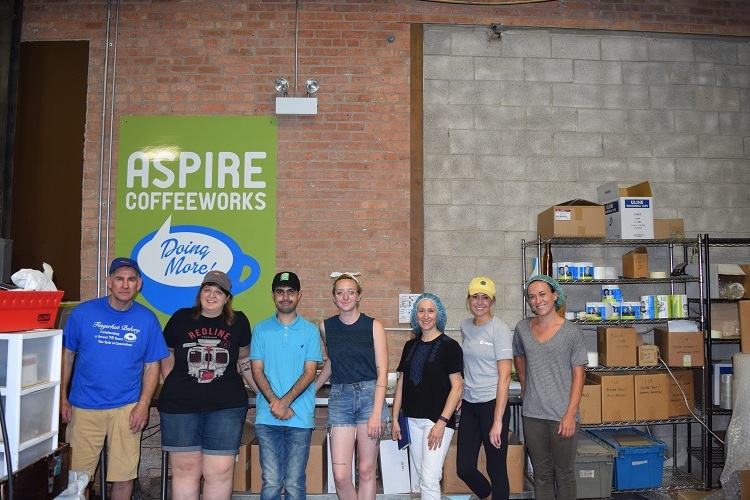 Last week we announced a new partnership with Chicago-based Aspire CoffeeWorks, which employs individuals with disabilities at Metropolis Coffee. We’ll be featuring their coffee in some new holiday gift collections, so stay tuned for those! We are also adding a socially conscious wine company to our list of Purposeful Purveyors. Q: And last but not least, what was the inspiration behind these Peruse with Purpose newsletters you’ve been sending? A: Friends and colleagues were asking me about Packed with Purpose and were naturally interested in what I‘ve been learning about in the social impact space. We wanted to share this more broadly. We hope you find inspiration in these newsletters, and if anyone has any feedback on how we could improve the content, please let us know.